Barbiturates are central nervous system depressants and were once frequently prescribed to treat insomnia. Today, benzodiazepines have mostly replaced barbiturates as sleep aids, but barbiturates are still prescribed as a general anesthetic, and for treating acute migraines, cluster headaches, and epilepsy. Despite their efficacy as an anticonvulsant and hypnotic, however, barbiturates have a dark side. They are addictive, and they’re also used during physician-assisted suicides and in cases of capital punishment. Barbiturate withdrawal is incredibly painful and requires medical assistance in order to remain safe. During the mid-nineteenth century in the United States, barbiturates were a commonly prescribed class of medication. But, addiction and overdose rates from barbiturate abuse started to climb. In response, benzodiazepines, thought to be less harmful and addictive, began to replace barbiturates as the first line of defense for patients suffering from seizures, insomnia, or migraines. While barbiturates are not as frequently prescribed as they once were, they’re still given to patients who have otherwise medication-resistance migraine headaches and severe insomnia. Even with regular use, tolerance to barbiturates can quickly develop. Research shows that tolerance can occur after just one dose of the medication. When tolerance happens, the person taking the drug will need to take more than the prescribed dose to get the same effect. Soon, the individual is caught in a cycle of dependence and abuse. They’ll start to take more and more of the drug, and sometimes mix it with alcohol or other medications to get a more pronounced effect, or high. Mixing barbiturates with alcohol is incredibly dangerous. Both act as respiratory suppressants and people who overdose on barbiturates mixed with alcohol have high death rates. Also, barbiturates have a short half-life, and people who are addicted can build up dangerous and toxic levels of the drug in their bloodstream. Taking other prescription medications and drinking alcohol dramatically increases the risk of an overdose, coma, and death. 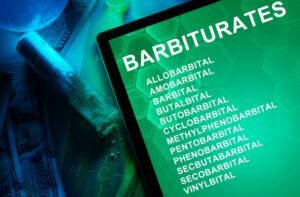 Long-term barbiturate abuse has been linked to high morbidity rates. 11% of men and 23% of women who have an addiction to barbiturates have high rates of suicide. Because of the unique chemical makeup of barbiturates, when a person who is dependent tries to quit, they’ll experience painful withdrawal symptoms, some of which are potentially fatal. It is critical that people with a barbiturate dependence seek help from professional doctors and therapists. What’s the timeline for barbiturate withdrawal? Because of its short half-life, symptoms of barbiturate withdrawal first appear within the first 24 hours after cessation or tapering off. The signs are most intense during the first 72 hours after cessation, and it is during this time that people are most at-risk for serious medical complications. During the first week, physical symptoms are at their most severe, but gradually start to taper off. The risk of major medical complications from barbiturate withdrawal is low. But once the person in recovery reaches the second-week mark, the emotional and psychological symptoms start to appear. Between weeks three to four, most of the physical symptoms will disappear. Emotional and psychological symptoms will begin to decrease as well. There may be some lingering effects for several weeks after, but they won’t be debilitating like in the first few weeks after cessation. For some people, they may develop a condition called PAWs, or Protracted Withdrawal Symptoms. These can last months to years after stopping barbiturate abuse. When someone develops PAWS, their brain is unable to handle stressful situations. They may end up with depression, anxiety, panic attacks, impaired cognition, or a loss of coordination when stressful events arise. For people with PAWS, they are at increased risk of relapsing. It’s crucial for people who’ve quit barbiturate abuse to continue receiving ongoing maintenance treatment to prevent a relapse and to alleviate any lingering PAWS symptoms. What are the physical symptoms of barbiturate withdrawal? Seizures from barbiturate withdrawal are especially dangerous and can lead to coma, respiratory arrest, and death. Does barbiturate withdrawal cause psychological issues? Is it safe to quit barbiturates cold turkey, or is a medically supervised detox recommended? It is not safe to quit barbiturates cold turkey or without medical supervision. Barbiturate withdrawals are very dangerous, and patients are at a high-risk of developing severe medical complications during the withdrawal phase. Also, extreme mood swings and agitation occur during withdrawal. People are at risk of harming themselves or others when this happens. It’s better for the addict’s and their families’ safety if they undergo a medically supervised detox. If someone quits cold-turkey, their chances of experiencing medical complications are high. In medical detox, doctors can put patients on a tapering-off schedule to lessen the chances of suffering dangerous side effects. What are some safe practices for barbiturate detox? During detox, patients need to be adequately monitored by experienced medical professionals. Barbiturate withdrawals can cause unsafe spikes in body temperature and heart rate, and also a severe drop in respiration, leading to coma. Patients need to be in a calm environment with trained medical staff available 24/7 in case they experience dangerous complications during the withdrawal timeline. What isn’t safe to do during barbiturate detox? It is not safe for people in recovery to undergo detox without supervision. In a medical detox facility, patients can be adequately monitored for any serious medical complications. Doctors can also keep patients from self-medicating with other drugs or alcohol during the painful peaks of physical withdrawal. Also, the first 72 hours of barbiturate withdrawal are the most painful and potentially dangerous. People in recovery are at high-risk of relapsing during this time. In a detox facility, therapists and doctors are on-call 24/7 to support patients during this challenging time. Also, in a supervised facility, patients do not have access to drugs or alcohol. Undergoing detox in a professional environment also prevents patients from harming themselves and others if they experience hallucinations or agitation during the second part of the withdrawal timeline. What happens during the barbiturate withdrawal process? In a medical detox facility, patients are first examined for any comorbid physical or mental health conditions. During the first phase of the withdrawal process, patients can ride out the severest withdrawal phase under the care and support of trained medical staff. Doctors can prescribe safe, legal medications to lessen some of the discomforts of withdrawal symptoms. Once patients enter the psychological part of the withdrawal process, therapists can support them. They can prescribe antidepressants or mood stabilizers to help them with these painful symptoms. Therapists can also monitor patients for thoughts of suicide or self-harm, which can be common during the second half of the withdrawal timeline and if a patient develops PAWS. During the latter weeks of barbiturate withdrawal, patients can be monitored for PAWS, and doctors and therapists can prescribe ongoing maintenance medications for PAWS symptoms. Also, once the severity of the withdrawal symptoms subsides, patients can begin rehabilitation at an inpatient facility. Here, they can work closely with therapists on how to live a life free from addiction outside of the facility. Therapists and doctors at an inpatient rehab facility craft customized plans for each patient. In one-on-one therapy, patients can explore their triggers, and what kind of stress or trauma led them to become addicted to barbiturates. During these sessions, patients can set goals and formulate plans for how to respond positively to adverse events outside of the facility, lessening their chances of relapse. In addition, for patients who undergo inpatient rehabilitation for drug addiction, they’re around dozens of people who are going through the same struggle. In inpatient rehab, patients feel less alone than if they were to try and quit outside of a facility. After they complete their stay in an inpatient rehab facility, patients are then encouraged to continue ongoing maintenance. Without it, they are at high-risk of relapse. Or if a relapse does occur without a maintenance plan in place, those in recovery are at a high-risk of falling back into old, destructive patterns. Maintenance plans usually include pre-scheduled therapy sessions where patients can discuss what’s happening in their lives. Ongoing therapy sessions help therapists see what is and isn’t working for the patients, and they can better help them to deal with adverse events or stressors which may tempt them to start abusing drugs again. Barbiturates are highly addictive and dangerous, especially during the withdrawal phase. People who wish to quit abusing barbiturates and their families are encouraged to seek help from trained medical professionals. Without adequate supervision during the withdrawal timeline, patients are at high-risk of harming themselves or others, and of not being able to quit barbiturates successfully. Please speak to a qualified rehabilitation specialist today and stop the barbiturate addiction and abuse cycle.